You can access the Subscriptions page by clicking on the Settings link in the top right corner of Widgit Online, and then clicking the Subscriptions link at the top of the page. The Subscriptions page shows you what type of account you have. There are two types of account, Individual User Accounts and Group Accounts. If you have a trial account, the Subscriptions page will tell you when your account is due to expire. Anyone can sign up for a 21 day free trial of Widgit Online. SymWriter customers can use their SymWriter licence key to enable a three month free extension of their Widgit Online account. You can also use a promotional key to extend your account. If you order direct from Widgit, you will receive a licence key that you can use to Activate your account from the Subscriptions page. If you have an Individual Trial Account, you can convert it to a Group Trial Account at any point. You will then be able to purchase a full group subscription. If you pay monthly, the Subscriptions page will tell you that your subscription is paid for by an Ongoing, recurring monthly payment. You will also be able to see the Monthly amount and Next payment date. If you don’t want to use Widgit Online any more, you can Cancel your subscription. After cancelling your subscription, you will be able to continue using your account until the remaining month has expired. Individual account users can upgrade to a family account, where the whole family can share and create symbol documents, each with their own username and personal files. If you have purchased a yearly subscription, this page will tell you how long your subscription is for and when your account is due to expire. You can purchase a 1 year, 3 year or 5 year subscription. Your account will not be renewed automatically. 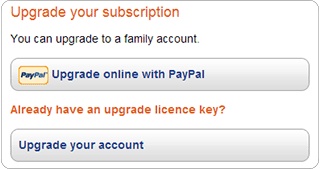 When your account is due to expire, you can Renew your subscription from the Subscriptions page. You can pay via PayPal, or order direct from Widgit to pay by credit card or invoice. If you order direct from Widgit, you will receive a licence key that you can use to Renew your account from the Subscriptions page. Individual account users can also upgrade to a family account to allow the whole family to share and create symbol documents, each with their own username and personal files. If you upgrade to a group account, you will only pay the difference between the account types for the time remaining until your renewal date. Group account users can change their group account type by contacting Widgit. You will only pay the difference between the account types for the time remaining until your renewal date. If you have a copy of SymWriter, you can use your licence key for a 3 month extension to your account. Users that have set up their account via PayPal will be able to see their invoices above their licence agreement. Users that have purchased direct from Widgit will be sent their invoice with their welcome pack. A PDF copy of the Widgit Online licence agreement can be viewed in the Subscriptions page.